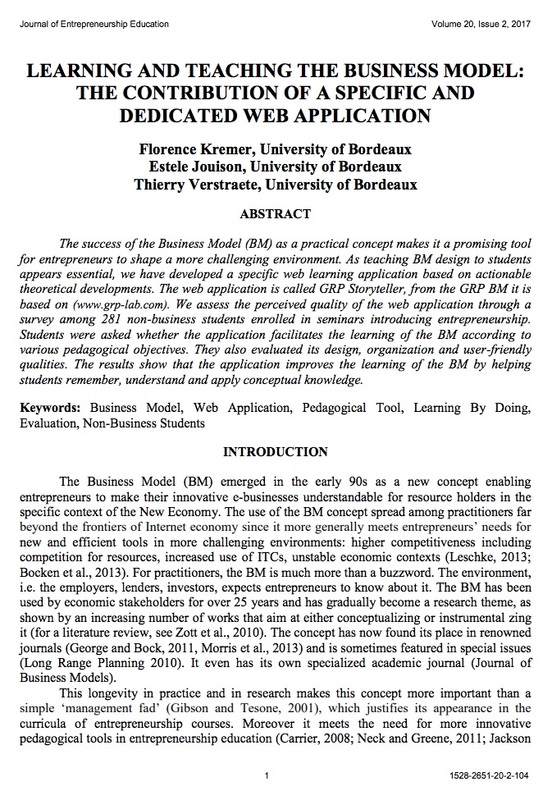 ABSTRACT The success of the Business Model (BM) as a practical concept makes it a promising tool for entrepreneurs to shape a more challenging environment. As teaching BM design to students appears essential, we have developed a specific web learning application based on actionable theoretical developments. The web application is called GRP Storyteller, from the GRP BM it is based on (www.grp-lab.com). We assess the perceived quality of the web application through a survey among 281 non-business students enrolled in seminars introducing entrepreneurship. Students were asked whether the application facilitates the learning of the BM according to various pedagogical objectives. They also evaluated its design, organization and user-friendly qualities. The results show that the application improves the learning of the BM by helping students remember, understand and apply conceptual knowledge.